CEO Marchionne says the integration of Fiat and Chrysler is at a crucial point: “I have never lived through a period with this level of complexity." Fiat-Chrysler CEO Sergio Marchionne remains convinced that the only way for an automaker to survive in the 21st century is to get bigger and work smarter. Three years ago, Marchionne predicted the global financial crisis would leave the world with six surviving global automakers and each would be building at least 6 million units a year. Since then, Fiat-Chrysler is the only major consolidation of automakers, but that hasn't caused the CEO to adjust his stance. "I have not changed the sense of my prediction, but more important than the absolute number of cars, is the volume produced per architecture," he told Automotive News Europe. Given the level of investment it takes to develop a mass platform, he predicts a minimum volume of at least a million vehicles a year to achieve an adequate return. "By 2014, we expect Fiat-Chrysler to reach 5.9 million units and we will have just three main architectures that drive more than 80 percent of that total volume," he said. The integration of Fiat and Chrysler is at a crucial point – which also represents a cornerstone in Marchionne's career. "I have never lived through a period with this level of complexity and this level of optionality," he says. In his vision, Alfa Romeo and Jeep both have the DNA and the rich history capable to make them the alliance's two global brands. "We need to continue to globalize Jeep and Alfa, so the development of architectures and engines that are designed to support these two brands is crucial, and everything else becomes almost secondary," he said. While Alfa and Jeep have to grow to a global status, the Fiat brand is set remaining a full-line player in Europe and Latin America, while elsewhere it will compete with a family of models based on the 500 minicar, like Mini does for BMW. "The Fiat 500 is a brand within a brand and so it is capable of expansion and declination in a way that effectively doesn't have to be associated with the rest of the Fiat offering elsewhere," Marchionne said. He added that he realized the appeal of Fiat as an international brand, given the way in which the markets have evolved, is limited. 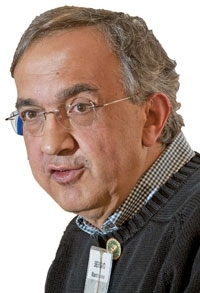 Asked why everything he does in Italy and for Italy receives more criticism than praise, Marchionne said that often people forget that Fiat was almost dead in 2004. "We survived the event – we are still here – on our own strength," the CEO said. "I am not sure this fact made everybody happy – for whatever crazy reason."